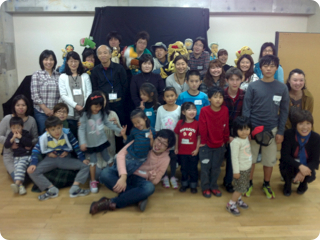 This past Saturday (10/29) a group of students from Tokyo Christian University came and shared their puppet show talent. We had a Kids Fun event at Cozy Hall. They did a great job! Most Saturdays kids are busy with sports or cram school study and it is hard for them to attend. But we had some first time visitors and several church kids. Everyone was a little nervous at the beginning, but gradually they warmed up to the TCU team and really enjoyed the games, songs, and puppet show. 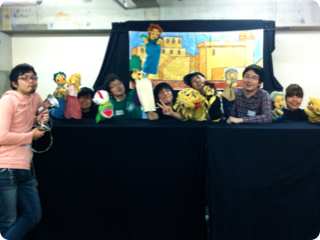 The puppet show was a script based on the story of Daniel and the lions from Daniel 6 in the Old Testament. In spite of the evil scheming of the king's men, Daniel chose to obey and honor only God. And God protected him and blessed him for it. Once again we learned the importance of loving, obeying and trusting God in the middle of hard circumstances. We are grateful for the TCU students taking time in the middle of their studies to come all the way to Denen Grace to share their ability and play with our kids. Remember that our next Kids Fun event will be a celebration of Christmas, the birth of Christ, and held on December 18. Please come!